The proposed city of Greenhaven would include about 300,000 people. Editor’s note: Read part one and part two of this series. Voters will decide this year on creating two new cities in DeKalb County. If passed, LaVista Hills and Tucker would be the eighth and ninth cities formed in metro Atlanta over the past decade. Supporters say incorporation is a better use of tax dollars, but not all in the county agree. At the Rainbow Creek subdivision in south DeKalb, it’s what you could call a bit of a suburban dream. Rows of two-story houses lined perfectly along sidewalks, tennis courts, a long pool and a community clubhouse. “We have a diverse group of people who live in our neighborhood. Some are educators, some are blue collar workers, some are university college professors,” Ed Williams, who has lived in this community for 16 years, said. He said still, many of the houses here have sat on the market for a long time, ever since the recession. 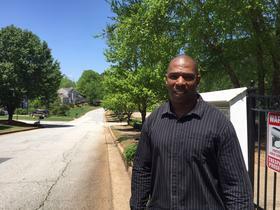 Home prices here haven’t rebounded like they have in the northern parts of DeKalb County, he said. Lenders and economic development typically stay away from majority black neighborhoods, he said. Williams lives in a part of the county that’s currently unincorporated and said he worries things could get worse if new cities are created. That’s because those cities tend to take in the flourishing parts of the counties, like shopping centers and corporate headquarters, which further erodes the county’s tax base. About 15 miles north in another part of unincorporated DeKalb County, residents attend a local arts and music festival in the Oak Grove neighborhood. In one booth, a man in a powder blue shirt hands out white lawn signs with the words “LaVista Hills Yes” written on them. Allen Venet, co-chair of LaVista Hills Yes, is trying to get residents to vote for the new city in November. The proposed city of LaVista Hills would be 65 percent white with a median income of about $59,000, which is about $20,000 more than unincorporated DeKalb. “I think that we’re entitled to tax dollars being spent more efficiently than the county spends them,” Venet said. But not all in the county agree that creation of cities is a good idea. “The county’s going to implode,” Robin Lee Fitch, a resident who lives in the area that would be LaVista Hills, said. “It’s going to be like a house on stilts, and when that one big wave comes, it doesn’t matter how tall or sturdy those stilts are. It’s going to go,” she said. To keep what they think is DeKalb County’s financial house from crumbling, some residents have formed a group called DeKalb Strong that opposes cityhood, or the creation of new cities. But Venet of LaVista Hills Yes says a productive city will benefit the county in the long run. “The existing cities ─ Decatur. Does Decatur help DeKalb County or hurt DeKalb County? I think it helps the county tremendously, and I think LaVista Hills will help the entire county,” he said. Regardless, the county says if LaVista Hills and neighboring Tucker become cities this year, the county will lose $13 million in tax revenue. The county’s tax-funded budget was $544 million for the 2015 fiscal year. “In other words, they generate currently more tax revenue to the county than they use services,” said Jay Vinicki, DeKalb County’s budget director. For example, he said if an area like LaVista Hills gets taxed $100, it only ends up getting $80 worth of services. In other parts of the county, there are receivers. Those areas get taxed, for instance, $50 but get the same $80 worth of services, he said. Lee May, the county’s interim CEO, says DeKalb will have to either raise taxes or cut services to accommodate the new cities. “It’s on the backs of county citizens and unincorporated county that enables them to be successful,” May said. But as new cities form in the north that’s prompted some residents in south DeKalb to fight back with cityhood proposals of their own. Kathryn Rice leads the effort to create the city of Greenhaven, which would include about 300,000 people, and have a population that’s 87 percent African-American, according to census data compiled by Georgia’s Legislative and Reapportionment Office. The median income of the city would be $41,418, according to a feasibility study completed by the University of Georgia. “We protect the citizens of southern DeKalb through incorporating,” Rice said. She said she doesn’t want people in this part of town to be saddled with extra county fees that city residents don’t have to pay, such as fees for pension plans. “It’s not a tool to achieve the quality of life, but it’s an outcome of cityhood. We would be protected from the financial consequences of not incorporating,” Rice said. But her group will have to wait another year. Greenhaven and the other city proposed in south DeKalb, Stonecrest, didn’t make it through the Republican-controlled state legislature. LaVista Hills and Tucker did. In the meantime, a study committee in Georgia’s Senate is looking at the effects of all these new cities are having on DeKalb and other counties, and whether they’ll lead to prosperity or bankruptcy.